General Secretary of the Communist Party of Vietnam and President Nguyen Phu Trong joined a great national solidarity festival with locals in Dur Kmal commune, Krong Ana district, the Central Highlands province of Dak Lak, on November 11. 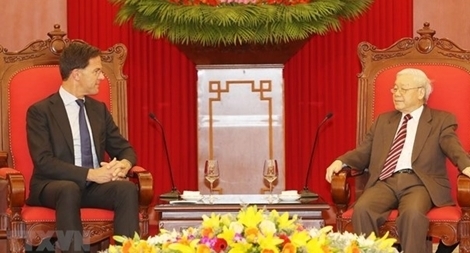 PSNews - President Tran Dai Quang, his spouse and the delegation of overseas Vietnamese offered incense to commemorate late President Ho Chi Minh then released carp into Uncle Ho’s fish pond to observe the traditional Kitchen God Day in Hanoi. President Tran Dai Quang visited Naval Team 2 of the Border Guard High Command and Company 33 on Ngu Island in central Nghe An province on April 30.